Enjoy light-filled, sunny days and balmy tropical nights perched in the comfortable aerie of Frigate House--you'll want to return again year after year. Arrive at Frigate House and your spirits will soar, just as magnificent frigate birds do on the trade winds that waft across St. Croix's prestigious east end community of Catherine's Hope. This one-level expansive homefilled with light, breeze, and sunsays tropical from lush plantings in its private garden to an oversize swimming pool with outdoor bar. 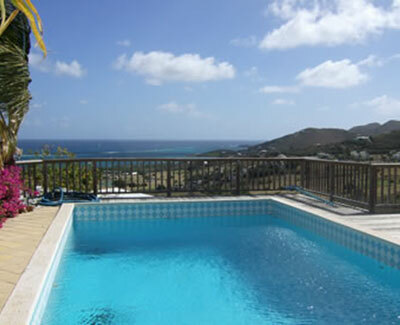 From the pool and a deck running the length of the house, you'll feast on views spread across the valley below to the ultra-blue Caribbean Sea. You'll never tire of gazing at the waves bordering Teague Bay, the Reef Golf Course, and the St. Croix Yacht Cluba great perch for watching February's International Regatta and Sunday sailboat racing all year round. Decorated in classic Caribbean style with imported fabrics, woven wicker, and mahogany tones throughout, this villa will delight you with its unusually spacious rooms that all face an exceptional view. The great room, with its handsome, beamed cypress ceiling, has cushy furnishings to sink into, grouped around a built-in entertainment center with cable TV. Four large ceiling fans add a cooling touch to the tropical ambiance. A chef's dream kitchen, with Tuscan-style Italian tile and beaded board cabinets, has storage and counter space galore, and is equipped with four barstools for casual meals. Or plan an elegant meal by candlelight at the adjacent dining area with French doors opened onto a hidden garden. Either way, the cooks will never miss a moment of conversation with this open floor plan. Each of the three roomy bedrooms has a private bathroom, ceiling fan, full sea view, and opens onto the deck through charming French doors. The east end's master bedroom features a high four poster king size bed inspired by the Whim Museum collection that will transport you back in time to plantation days. This room has a private bath with shower and whirlpool tub, and a white beaded board vanity with a Corian counter and twin sinks. The second master bedroom, also with a king bed, is at the opposite end of the house just a few steps from the pool and is furnished in island-style white wicker with a romantic bed netting. Its tile bathroom features a walk-in shower, ceiling fan, and white beaded vanity with granite counter and his & hers sinks. An additional bedroom in the center of the house, decorated in restful green and earth tones, has a queen bed and private bath with shower leading back to the great room. Bring along your laptop if you need to stay in touch with the worldthis room has a convenient desk area and the house is equipped with broadband wireless internet service. For sunny days on the water, excursion boats to Buck Island, resorts, and beaches are just a few minutes away by car. On evenings when you're ready to go out, you'll find several of the island's most popular restaurants and the Divi Carina Bay casino a short drive away. And for even more fine dining, shopping, and sightseeing options, Christiansted and Gallows Bay are only 20 minutes away along the convenient east end road.